Mary Mackillop, a woman ahead of her time - her work & motivation. 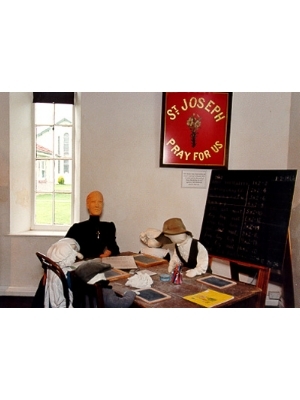 Early education in Australia Father JT Woods - Priest. Scientist - His interesting and significant scientific work in the region. The Schoolhouse - Historic building of 1867. The Interactive centre was built in 1998 - Interesting Architectural design. $3.50 per person, school children free, $2.40 per person for coach groups. Mainly text panels with supporting artefacts and early history of Penola and the region of South Australia. Woods Mackillop Schoolhouse. Commissioned by Father Julian Tenison Woods. 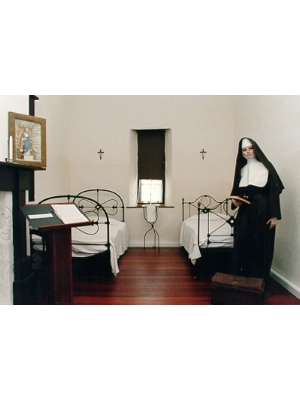 Blessed by Mary Mackillop taught and lived there in 1867.